Extensional Viscosity with e-VROC Viscometer | Small Sample Viscometer | Microliter Sample Viscometer | High Shear Viscometer | RheoSense Inc.
20 Different Shear Rates with 18 uL of Sample! Can Your Proteins Take the Heat? How do Your Proteins Interact? Want to Learn more about Extensional Viscosity? Want to learn about how extensional deformation or shearing has such a significant impact on industrial processes? Interested in what happens when you compare Xanthan and HPAM Solution Extensional Viscosity for enhanced oil recovery? e-VROC™, the viscometer capable of measuring apparent extensional viscosity, measures the extensional flow of polymer solutions to help you understand and optimize your industrial processes. 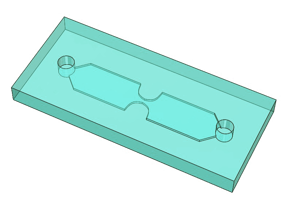 By monitoring the sample flow through a microfluidic contraction within the measuring cell, e-VROC™ provides precise apparent extensional viscosity data. Because extensional flows greatly impact the behavior of polymer molecules and asymmetric particles, understanding extensional viscosity allows you to improve your industrial processes. With accurate data, you can gain a deep understanding of the composition of the fluid, predict the impact of that composition on your process, and optimize your process based on the characteristics revealed by the data. 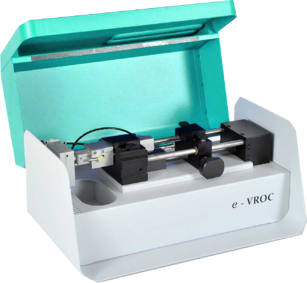 e-VROC™, built with Rheosense’s patented VROC® technology, is an excellent tool for measuring both the extensional and shear viscosities simultaneously. The viscometer measures the pressure upstream and downstream of a contraction using the MEMS pressure sensors, and it registers changes in the flow. The fluid undergoes an almost constant extension through the contraction/expansion, enabling the calculation of the apparent extensional viscosity. The e-VROC™ chip is engineered with a microfluid channel of uniform width and depth. It has hyperbolic contraction/expansion zone in the middle of the channel and four monolithically integrated MEMS pressure sensors (two in the upstream and two in the downstream of the contraction/expansion zone). A liquid entering the channel first experiences shear flow in the straight channel and then experiences a uniform extension in the contraction zone as illustrated by the elongational shape change of the square in the schematic below. Compared to other methods of extensional viscosity measurement, e-VROC™ allows the measurement of extensional viscosity at high extensional rates. Step 3: Bring down the top of the thermal jacket enclosure and lock it by turning the black thumb screw clockwise— you are ready to measure your sample! e-VROC™ is a good choice for the measurement of fluids with certain extensional viscosity properties, such as polymer applications, which exhibit thickening beyond the Trouton ratio found for Newtonian fluids.